With Grow With Guidance System® Workshops and Training; you too can successfully move your district forward! Want to hear this kind of feedback from your Conference? Schedule the BEST keynote to move forward! We are looking forward to assisting you in your process of creating an outstanding educational system for students, staff, and families. Dr. Radd combines over thirty years of experience as a practitioner and counselor educator to bring you practical yet innovative growth opportunities. She can provide quality professional training and workshops for your specific needs and location. Learn an innovative approach to education that develops students’ spirit, purpose, and potential. 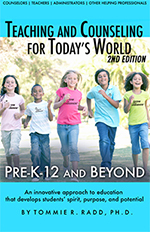 This experience, based on the book with the same title, explores critical concepts for education in the 21st Century and explains the innovative role of developmental guidance systems. Learn how to prepare students with skills needed for life success, present and future. The Grow With Guidance® System is brought to life with this experiential System overview. Gain a working understanding of the System components. Plan a minimum of one day to one week for this development experience. Remember, initial quality time spent results in greater gains and time saved later. Learn how to build the foundation of your School-To-Career Program. This workshop explains how to develop a comprehensive guidance system for successful School-To-Career program implementation. Learn strategies for positive classroom discipline. How does your behavior style affect your plans for the classroom and school? Suggestions on improving student-teacher and student-student relationships are explored. Discover realistic ways to make behavior a part of learning. Gain a greater understanding of self-concept and how it develops. Learn how to weave the Self-Concept Series into your day-to-day language with students. Learn and experience a practical process that brings self-concept ideas to life for students, staff and families. This is an important base for everything you do!!!! Are you a part of the educational restructuring plan for your school district and school building? Do you understand how guidance and counseling programs are the key to the success or failure of educational redesign? Learn more about what you are already doing or can do that can make your school district redesign efforts successful. All of the listed development workshops are available in an expanded or abbreviated format upon request. Also, let Grow With Guidance® develop a workshop to meet your school district needs. Contact us soon to schedule. School districts are asked to duplicate development workshop materials and provide funding for all expenses in addition to the development workshop fee. Curriculum and staff development moneys can be found through foundations, corporate support, student at-risk grants, drug-free school grants, and other sources. Please click here for our list of funding sources. If you are interested in a Grow With Guidance® System workshop or training please fill out the form and we will be in touch with you shortly.